JRPG Jungle: Japanese Finds: The Digivice Is Back?!?! Japanese Finds: The Digivice Is Back?!?! I've never grown out of my tendency to click on any Digimon related news I find. Today was no exception, but it ended with some really cool nostalgic news! 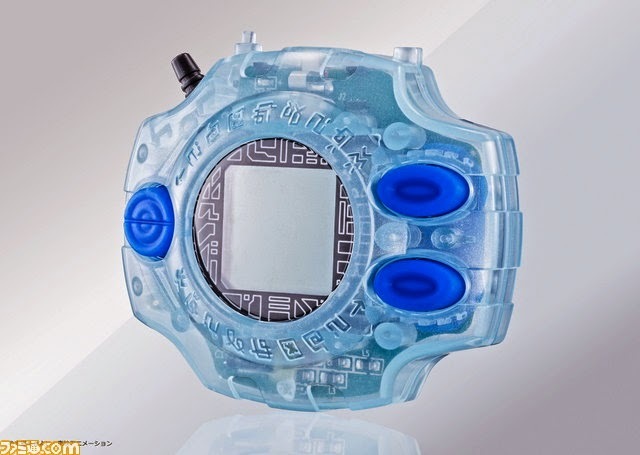 Famitsu's original post's headline states that for the Digimon Adventure's anime's 15th anniversary they will be releasing a brand new colour digivice. A Japanese trailer can be watched below, which will most likely fill 90's kids with major nostalgia. While the Digivice seems to be quite expensive (according to Bandai's toy website, you can order it for 9,990 yen, which is roughly $100 Australian dollars), these still look like a lot of fun to play alone or with friends. This is a learning experience for me, but I want to share my finds to those interested. Naturally, I won't share anything that I'm unsure about, so please enjoy the information. More importantly, did you have a Digivice when you were a kid? I had three editions (I think my favourite was one of the later ones which used trading cards as well), although if series one toy was a digivice style when I was younger, I missed it! I used to sit in the car with my family, shaking my second series digivice until it evolved and had all the step counts memorised. I was a very social child. Let me know your digivice stories in the comments below or on Twitter via @JRPGJungle, where you can follow us for immediate JRPG Jungle articles and updates!